Antler King has researched deer nutrition for over 25 years. In the past couple of years, research has pointed to the vast importance of certain special trace minerals that will greatly enhance overall health and antler growth. antler king’s power rack is loaded with these special trace minerals and in the proper proportion. 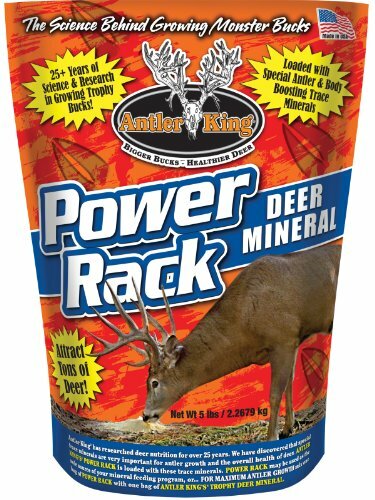 power rack may be used as the sole source of your mineral feeding program or for maximum antler growth, mix one bag of power rack with one bag of antler king’s trophy deer mineral. Loaded with special antler and body boosting trace minerals. •Includes Vitamins A, E and D.
•Easy to use – just pour out near deer trails or other areas frequented by deer. •Offers important trace minerals for overall herd health, antler development and fawn growth. •For maximum antler growth mix one bag of power rack with one bag of trophy deer mineral. • Power Rack Deer Mineral will attract deer. Check your local game laws for baiting regulations before using. Power Rack deer mineral is very convenient and easy to use you can just pour out near deer trails or other areas frequented by deer and that's it! If you have any questions about this product by Antler King, contact us by completing and submitting the form below. If you are looking for a specif part number, please include it with your message.